Two new heat recovery ventilators from Johnson Controls help improve indoor air quality. 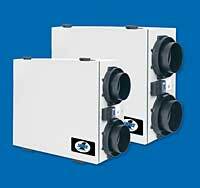 The cross-flow heat exchangers are made of durable polypropylene; the larger unit generates airflow of 50-200 cubic feet per minute (CFM), and the smaller unit generates 30-160 CFM. Intermittent and continuous operating modes combine with the variable speed and proportional evacuation defrost capability. The heat recovery core carries a lifetime warranty and the sloped drain pan includes a balancing system with backward, inclined motor blades and a five-year limited warranty on the motor.